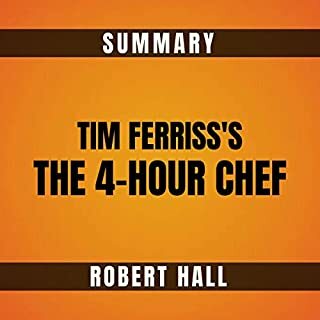 In this audio summary of The 4-Hour Chef, Tim Ferriss teaches you not only the art of cooking but the art of learning. 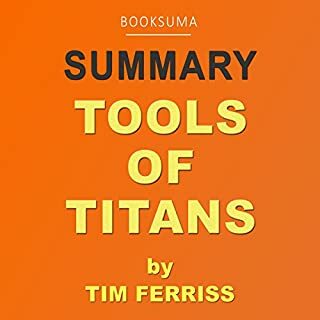 In Tools of Titans, best-selling author and podcaster and human guinea pig Tim Ferriss has published his entire notebook of high-leverage tools and advice gathered from his super-performer podcast guests (and, notably, only those things he has vetted in his own life). The book explores the dozens of personal health, wisdom, and wealth strategies and tactics Ferriss has picked up from his podcast guests and used successfully himself. This is a summary of The 4-Hour Body, which is is a one-stop shop for attaining the body you've always wanted. Author Tim Ferriss is a Princeton grad, national kick-boxing champion, former owner of a sports nutritional supplements company, and has dozens of friends who specialize in various forms of athletic training, competing, and nutrition. It is very evident that Tim knows what he's talking about when it comes to health and fitness. 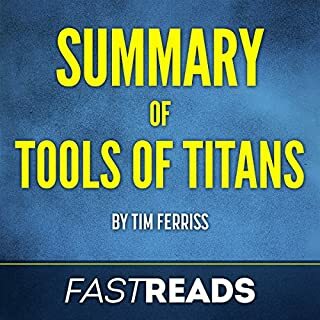 This is a premium summary and analysis of Tim Ferriss' popular book Tools of Titans: The Tactics, Routines, and Habits of Billionaires, Icons, and World-Class Performers. Designed with busy people in mind, it will give you a firm grasp on the story without sacrificing quality! Give it a try! This audiobook has been designed to teach steps to be taken in a luxurious lifestyle. The author has further elaborated this by giving Tim as an example. Initially, Tim used to earn $40,000 annually, but later on he started earning the same amount on a monthly basis. Further, the audiobook teaches you how to outsource your life abroad, by embracing virtual aid which will cost you only five dollars per hour. Timothy Ferriss is a world-renowned podcast host whose podcast downloaded over 100 million times. He is a lifelong learner and journal entry writer. He takes his love of learning and note-taking and shares with the listener the collective wisdom of hundreds of people who are doing life the way we all wish we could. Through three sections of health, wealth, and wisdom, Ferriss lets the average Joe in on the secrets of the successful. Join author Tim Ferriss as he shares the incredible experiments he's done over 10 years to beat genetics and achieve the impossible…for himself and more than 200 men and women aged 18 to 70. You don't need better genetics or more discipline. You need immediate results that compel you to continue. This is an abridged edition. 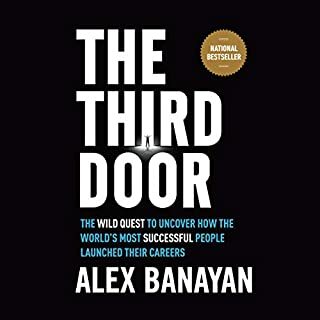 This audiobook is interesting and seems to be well done. The big problem with it is the false advertising in the description, which obviously is still identical to the one used for the hardcopy book. Many of the key topics (including 2hr sleep, reverse injuries, run 50k etc.) are not covered at all. They are key components of the books description page, but are left out of the audio entirely. Lame! Shame on whoever is in charge of selling this under false pretenses. I knew the book was abridged, but shouldn't it cover the highlighted points on Audibles' description page? 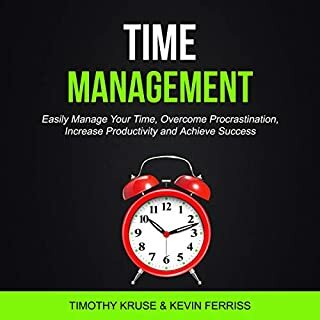 I thought the info in this book was awesome, and I really like Tim Ferriss, but hald the things that the description said this audiobook would cover, didn't even get touched. I'm a huge Tim Ferriss fan. Waited until midnight to buy this on release day. I've purchased audio and multiple hardcopy versions of 4HWW (including a personalized autographed revised edition). What I read in Four Hour Body was great. Unfortunately a ton is missing. The audiobook details say it's abridged, but promise information that is NOT contained in audiobook. Missing info includes: Reaching Genetic Potential in 6 months, Running 50K in 12 weeks, Sleeping 2 Hours Per Day, Reverse Permanent Injuries, Add 150 Lbs to Lift in 6 Months, Pay For Beach Vacation w/ Hospital Visit. I'm sure the unabridged book is great. And this rating would have many more stars if not for the false advertising of missing information. I knew going in that this audio book was abridged but wow! It's not abridged, it is butchered. Looking at the original book's table of contents on the author's website it is seems that more than half the book is missing. Literally there is at least one section of the abridged audio book that references a chapter that was excluded! I would love to see an unabridged version of this book available on audio book. Looks like I'll have to get an eBook version. Save your money or credits until a full rendering of this one is made available. Really too bad because the actual subject matter is great and I am a fan of Tim's. Actually, an abridgement of Tim Ferriss's work really makes little sense to me. Tim really writes cheaters guides (not a critisim at all). He's giving you the fast track info. Why shorten it even more? 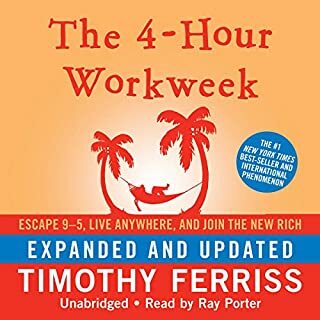 I was excited about this book because I read 4-Hour Workweek, and I've really liked some of Tim Ferris's work, but after listening to this, I'm a bit disappointed. I think that Audible should do a better job of making it clear that a book is abridged, but that's an aside. This is a snippet of the book, and although parts are interesting, a lot of what's in this snippet has either been posted on his website or is common knowledge, at least to bodybuilders. Still, if you want to get an overview of what the print copy could offer it could be worth it. It's the type of book you'll need the print copy for anyway so that you can have it for reference. Abridged version is total ripoff, It is missing a lot of the book. Major sections ommited. Someone needs to correct this. When i bought this i was under the impression it was un-abridged, (i like the other reviewer awaited 12:00 and bought it early in the morning maybe my eyes were playing tricks on me) after getting through about half of the audiobook i stopped by a book store to check out the hard cover... almost 600 pages, 2.9 pounds! to say that there is some things missing is an understatement for sure. The narrator is a bit annoying but tolerable. There is some useful info in here but overall if you want the most from this book you are going to have to buy the actual hardcover and read it. Buy the book not the audio. I was extremely excited for this book but the information is nothing compared to the actual book. I went out and bought a copy when I noticed that many of the pieces were missing. I ABSOLUTELY LOVE THE BOOK! It's more like a manual and you just can't capture the essence in an audiobook. Yeah.. it's a shame how chopped to pieces this version is. I was really looking forward to this book after reading the description. I have about 2 hours of the audio left and after seeing just how HUGE the hard copy actually is I knew that something strange was afoot. This audio is a butchered version.. I'm going to assume it's for good reason, but I'm more than annoyed at wasting a credit on this. I'll finish it, and I'm sure it will be good info, but there's so many topics in the description that I want to conquer and I'm peeved at having to pay twice to do that.